The kids at our school often come hungry. While we do feed the children a hot meal every day, those first few hours before lunch can be difficult to manage. If you took a close look at the preschool pencils, you’d notice that the majority of them have little teeth marks and the erasers are missing. Replacing erasers was the least of our worries. It's very difficult for a child to concentrate when they are hungry, so a simple solution came in the form of a BOB. BOBs are Breakfast Oatmeal Balls that are easily made and given to the early morning students. They are made with oatmeal, raisins, honey, breadfruit flour and flax seed. On occasion we will even add mini chocolate chips. All supplies have been donated and are not taken from the regular school budget. The students love them and we can all agree they are tastier than erasers! Ann serving up her BOBs. Providing BOBs has been a team effort. Since the school budget cannot cover the cost of this additional snack we needed to get a little creative. We’ve had several donations of oatmeal from friends in Illinois, our Board members have packed pallets and containers and others have donated transportation costs. 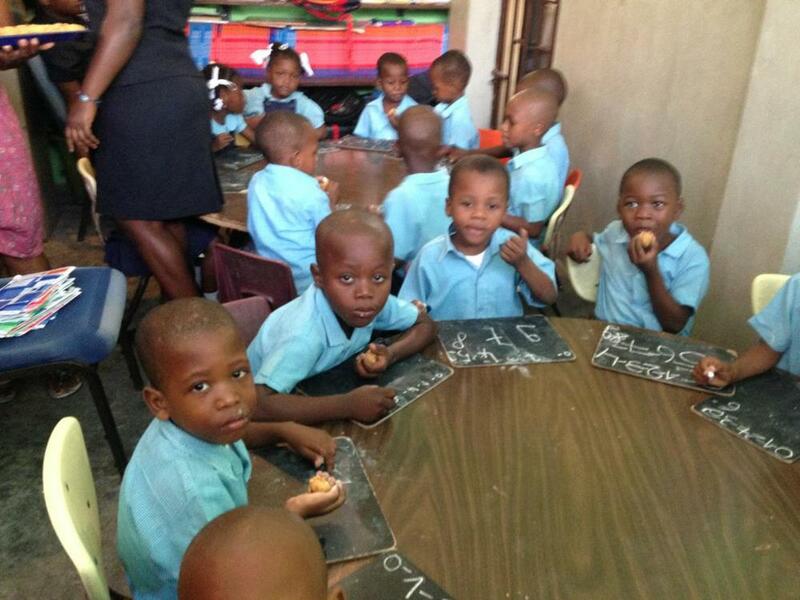 Even our Haitian staff members have donated their time to mix and roll the balls for these kids at the school. Many thanks to Ann and Ed Rice, Dana Meyers and Jeana Valdivieso and countless others for caring! To sponsor one of our students CLICK HERE. To make a general donation CLICK HERE.